This is not a fashion post. This is a post about love. My Tolkien journey is a very easy one to describe. I discovered the books when I was young, and then I wanted to be Éowyn. ‘Look!’ [Gandalf] cried, and they lifted their tired eyes. Before them stood the mountains of the South: white-tipped and streaked with black. The grass-lands rolled against the hills that clustered at their feet, and flowed up into many valleys still dim and dark, untouched by the light of dawn, winding their way into the heart of the great mountains. Immediately before the travellers the widest of these glens opened like a long gulf among the hills. Far inward they glimpsed a tumbled mountain-mass with one tall peak; at the mouth of the vale there stood like a sentinel a lonely height. About its feet there flowed, as a thread of silver, the stream that issued from the dale; upon its brow they caught, still far away, a glint in the rising sun, a glimmer of gold. I was never very good at the demands made on little girls (and this was in the 70s and 80s) to be good, pure angels, compliant and pretty and sweet. Not that I was a little hellion, far from it. I tried very hard to make everyone like me, and to be what my teachers and parents and parish priests and all the rest wanted. And in the meantime, in my imagination, I slayed the Witch-king. Faramir loved me. And even though I refused a cage, I finally accepted a garden. I tip my cap to Miranda Otto for her characterization in the movies; I think she really captured Éowyn’s pride and longing. Her desperation was palpable. It hurt. …Grave and thoughtful was her glance, as she looked on the king with cool pity in her eyes. Very fair was her face, and her long hair was like a river of gold. Slender and tall she was in her white robe gilt with silver; but strong she seemed and stern as steel, a daughter of kings. Thus Aragorn for the first time in the full light of day beheld Éowyn, lady of Rohan, and thought her fair, fair and cold, like a morning of pale spring that is not yet come to womanhood. I was a girl who wanted more than to be decorative, not that my looks were up to the task. I was a girl who wanted to achieve as much as I could, not just as much as was expected. I was a girl who wanted to be free. Just like Éowyn. 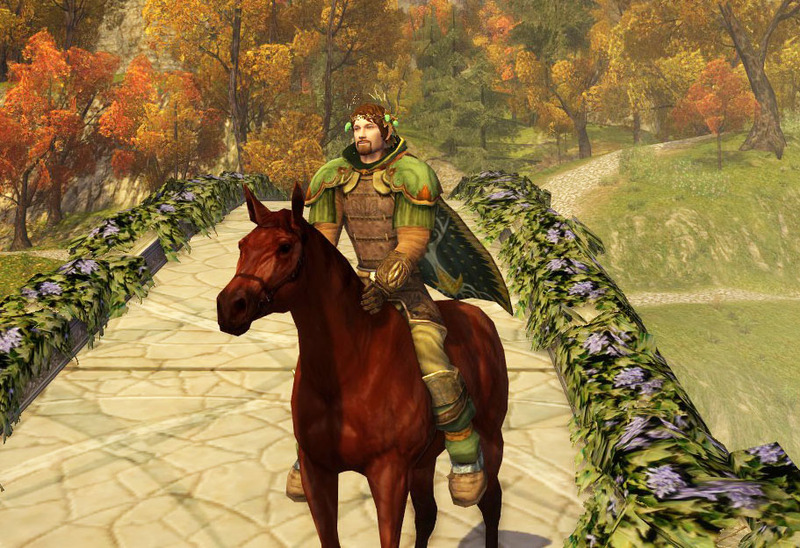 And I know we don’t have Meduseld in the game yet, but when I crossed the bridge south from Great River into Rohan, the music swelled and I burst into tears. And I don’t have any problem admitting that. Okay, fair warning: I’ve used this combination of cloak and shoulders before. Recently, even! But it’s like having a humble can of black beans in your pantry and using it over and over in a dozen different things: there are only so many cosmetics in the world. Maybe I’m just obsessed with autumn (this is true), and therefore, the Cloak of the Autumn Wood pops into my consciousness over and over. This sounds so whiny-pants, but I’m getting very tired of this perfect California weather every single day. I want autumn’s wind and bluster. I want rain. So forgive my outfit redux, but I just want a little bit of changing leaves and Halloween and dismal morning rain already. The majority of this outfit is the Ceremonial Spear-shaker’s set. Add to that the gorgeous Harvest-brew Circlet (which thankfully isn’t just a chain of pretzels), and to my autumn-addled brain, you get an outfit of brown leathers and olive accents, of an autumn spirit that wanders the colorful woods like a Goldberry keeps to her rivers. I had fun with this one. I struggled with individual pieces and color until I made a last pass through the Ceremonial Helegrod items in the LOTRO store. When I clicked “try it on” with the Ceremonial Silver-voice Shoulders, it all came together. 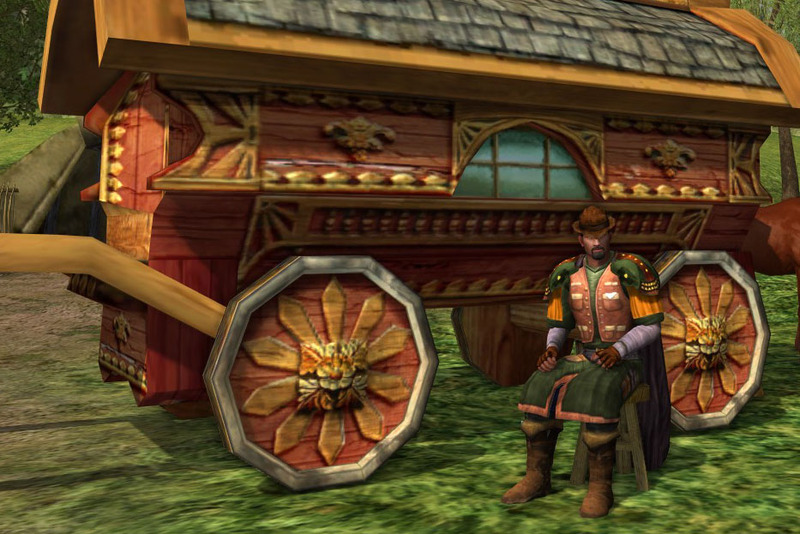 The traveling merchant owns a wagon of delights, from bolts of dyed cloth to wrought tools and exotic goods from lands most Bree-men will never visit. With a grin and a wink, he sells and haggles. His Craftsman’s Robe has a dozen pockets, all containing some small delight for matron or child, whether a hair-ribbon, a bone button, or a little dragon carved from wood. He passes through remote hamlets maybe once a year. Maybe every two years, if weather and the roads have been hard. Whenever his painted wagon begins to rumble up the rutted road, townsfolk gather to see what tales the traveling man might bring. …I realized after typing that title that it sounds fairly grim, in a Game of Thrones sort of way. AUTUMN. IS. COMING. But I love autumn, every bit of it. Pumpkin this, harvest that, the smell of woodsmoke spiraling up from chimneys, the skitter of leaves on sidewalks. All of it. 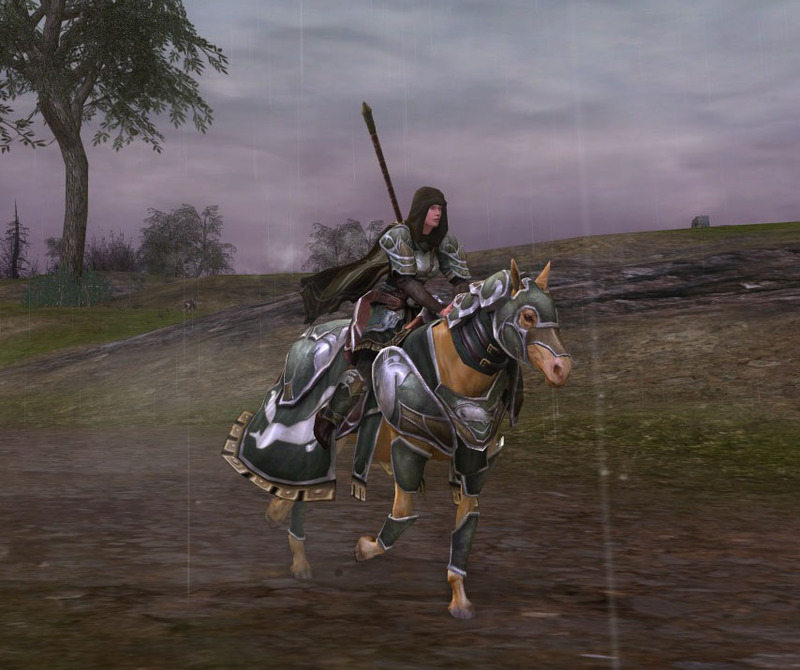 All I want to do is wear cowl-neck sweaters and cook root vegetables (and destroy things on horseback in Rohan). This outfit began with the Robe of the Stone-hewer with its crimson and gold and purple accents. I must have tried twenty cloaks with it in an attempt to balance the colors, and settled on the Cloak of the Autumn Wood. I’m not entirely happy; that said, the theme sure remains intact. With neutral, simple gloves and shoulder pads, the cloak and robe work together in the same basic color family, and suit my love of crazysauce pattern and color. 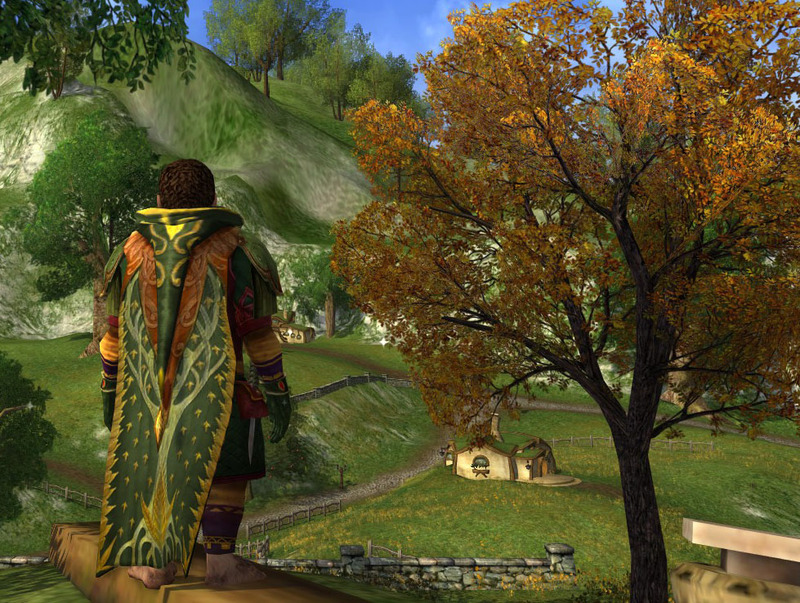 If Hobbits wore boots, there would be some purple and gold. I do love Dwarves. And I love scholar-types, and someday – someday! 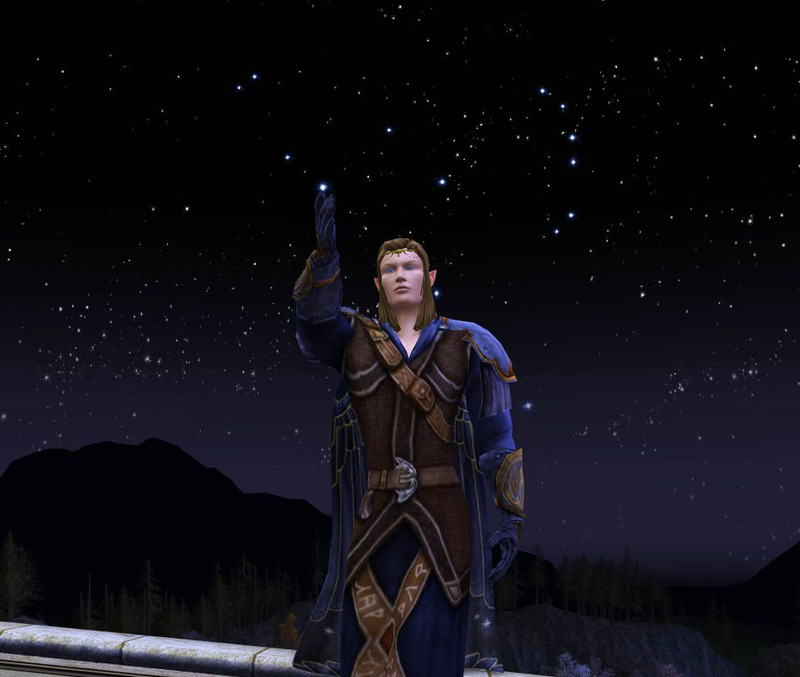 – I will do a Dwarven scholar outfit up at Nar’s Peak, with all the books in the woooorld! But for right now, Dwarven model Gundri Gladstone has other ideas. He’s taking a tour of Eriador’s halls of records. This post, he’s starting at the Dwarf-fortress of Gondamon and then traveling across the Shire and Bree-land to reach the Archives at Bree-town. He’s formally dressed, of course; it doesn’t do to be rude to the locals, or to not show his home halls off to their most splendid and noble effect. 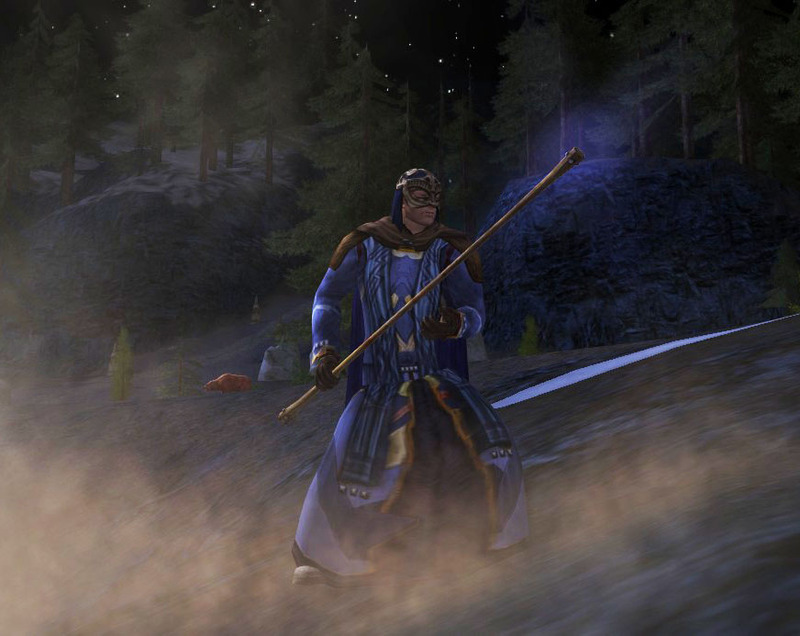 Starring items in this outfit are the Hauberk of Rhun, available in the LOTRO Store, and the Hat of the Concerned Elf, which is a Great River epic quest reward. I know it’s an Elfy sort of hat, but Gundri travels far, works with Elves and Men and Hobbits alike…and if he finds a practical hat that keeps the sun off his increasingly bald pate, he’s going to use it. 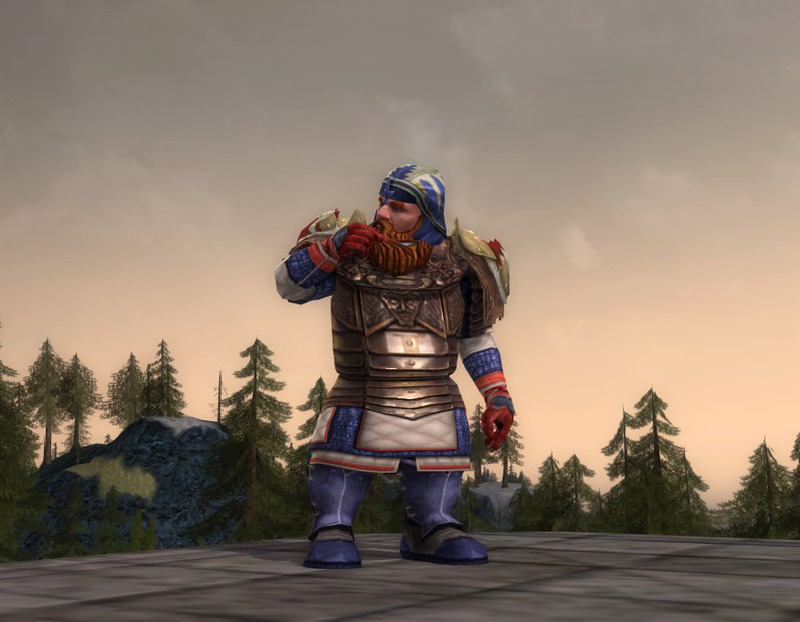 Supporting players include the Sturdy West-guard Shoulder Guards of Strength and the Rusted Boots of the Dunland Beserker. I did not realize until after that I gave him a rather patriotic red-white-and-blue look, but the blue is for his home mountains, the red was in the hauberk already, and …it just looks classy!